Modern NGK and Champion equivalents to KLG spark plugs for classic motorbikes. 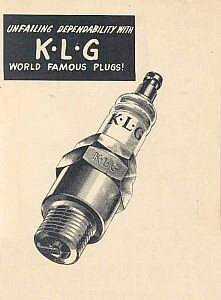 A KLG spark plug was once the standard fitment to many classic motorcycles, including both of my two Matchless G3’s. However it is not a make you really hear too much of these days with NGK and Champion dominating the market. KLG plugs are still available from some specialist sources (such as the Green Spark Plug Co.) but they aren’t exactly mainstream any more and certainly aren’t available out here in Asia (at least that I have found!). For most people with classic motorcycles it is usually easier, cheaper and more convenient to substitute a modern equivalent from one of the mainstream manufacturers in place of the original KLG model. And hence the point of this page – to understand the differences between the original KLG plug types and determine what the modern NGK and Champion equivalents are. For more information on Mr. Kenelm Lee Guinness, the man behind the ‘KLG’ brand name who developed his innovative spark plug for racing using mica as an insulator, check out this Wikipedia article. The codes used to denote each particular type of KLG spark plug are similar in arrangement (although not in lettering) to the NGK code system, and are fairly easy to decode once you know what each section indicates. The following table gives the meaning of the most common letters found in the KLG numbering system. For example, the KLG ‘FE80’ plug code means that it is a 14mm diameter plug (F) with extra long 3/4″ reach (E) on the thread. Similarly a ‘FS75’ is a 14mm diameter (F) short 3/8″ reach (S) plug, and a ‘F50’ is a 14mm diameter (F) standard 1/2″ reach (no 2nd letter) plug. The numbers that follow the above letters in the KLG spark plug code give the heat range of the spark plug. A low number is a hot plug and a higher number is a cooler plug. The lowest rating I’ve seen mentioned in literature is a 20, with 70 to 80 being normal for most classic motorcycles, and 220 being the highest I’ve come across for a really cold plug. For more about spark plug temperatures, read the ‘Spark plug heat ranges’ page. For the meanings of spark plug codes used by other manufacturers such as NGK, Champion and Bosch, please refer to my ‘What spark plug?’ article. The following tables detail the modern equivalent NGK and Champion spark plugs for the KLG ‘FE’, ‘F’ and ‘FS’ series of 14mm plugs typically used with classic motorcycles. Tables are also shown for the projected nose versions of these plus (plug codes ending with a ‘P’). The alternative NGK spark plug numbers given in brackets are ‘upgrade’ or ‘performance’ types which usually have a finer or precious metal (e.g. platinum or iridium) central electrode which is designed to give improved sparking. However the improved performance seen on a classic motorcycle is debatable and these plugs are typically much more expensive than the standard ones, so they might be worth a try but you will have to weigh up cost versus any noticeable difference to engine running. Some owners do however report easier starting or improved idling when using these plug types. You pay your money and take your choice! I have drawn up the following tables by cross-referencing the NGK and Champion websites and catalogues with various archive KLG literature and also several reference books. Many of the older spark plug codes are now obsolete so the tables list only the current part numbers, so you may come across old stock that is also equivalent (e.g. a Champion N5 is now a N5C). However it would confuse matters to include all historic variations here. If you need to look up other obsolete plug models, the best reference material I have found is the NGK motorcycle catalogue which gives compatibility listings for all plug manufacturers. Also note that the heat ranges of the different manufacturers don’t always directly correlate. It is usually safe to vary by one heat range either side of the recommended plug as modern plugs have a wider operating temperature than older models, but better to err on the colder side where possible. This is a range of 14mm spark plugs with a 3/4″ thread reach. They are non-resistor plugs and have a standard (non-projected) nose. Examples include the following models: FE50, FE70, FE75, FE80 and FE100. This is a range of 14mm spark plugs with a standard 1/2″ thread reach. They are non-resistor plugs and have a standard (non-projected) nose. Examples include the following models: F50, F70, F75, F80 and F100. This is a range of 14mm spark plugs with a short 3/8″ thread reach. They are non-resistor plugs and have a standard (non-projected) nose. Examples include the following models: FS50, FS70, FS75 and FS100. This is a range of 14mm spark plugs with a extra-long 3/4″ thread reach. They are non-resistor plugs and have a projected nose as designated by the ‘P’ suffix. Examples include the following models: FE55P, FE65P, FE85P, FE125P, FE95P and FE135P. This is a range of 14mm spark plugs with a standard 1/2″ thread reach. They are non-resistor plugs and have a projected nose as designated by the ‘P’ suffix. Examples include the following models: F55P, F85P and F95P. This is a range of 14mm spark plugs with a short 3/8″ thread reach. They are non-resistor plugs and have a projected nose as designated by the ‘P’ suffix. Examples include the following models: FS45P and FS55P. None of the KLG spark plug models mentioned in the above table have internal resistors since they mostly pre-date in-car radios and hence interference suppression was not an issue. Resistor spark plugs (e.g. NGK plugs with an ‘R’ in the code) should technically be used where possible to reduce interference, but these are not usually suitable for use with magneto ignition systems. For more information about resistor spark plugs please see my Spark Plug FAQ’s. Hopefully the above article has helped to explain the spark plug reference numbers used by KLG and has pointed you in the direction of an appropriate NGK or Champion equivalent plug. This is aimed as a guide and there may be some variations between vehicles due to local climate, setup, fuel and other such factors. If in doubt as to which plug to fit, always go with the cooler option first as at worst this will result in plug fowling, whereas choosing a spark plug that is too hot could end with a hole being melted in the top of your piston. Not good! Please use the form below to leave me your thoughts and comments, especially if you have a particular experience with these spark plugs that you would like to share with other readers. Hi Justin. Absolutely no idea I’m afraid, not even sure what exactly it is. What a revelation your site regarding the technical backgrounds when keeping my Matchless on the road. A serious proffesional attempt ( no, a real succes !! ) to set things straight in a readable manner. This is “IT” in a nutshell, especially useful for those of us trying to run weird old vehicles! Do you know what happened to KLG as a company in latter years? Hi Rhys, I’m not 100% sure, but I think Smiths Industries may have had something to do with it. Asda have a supermarket where the old factory was. By the way have a look at Wiki and scroll down until you find something about Find a grave. There are a couple of photos of where Lee Guinness is buried. Very sad. Do you happen to know the modern equivalent of a KLG CK1? That is the original plug that I think belongs to my 1930 Peugeot. I have what I think is a racing type KLG spark plug, the box is labeled FE80 Three Point Detachable. It has three electrodes each at 120 degrees spaced, can you tell me anything more about this plug? I guess this to be a pretty trick racing plug,the porcelin portion is removable, there is the standard 13/16″ hex, then above that there is a 3/8″ whitworth hex, when unscrewed, the center electrode comes out.The porcelin top is standard markings;KLG & FE80, the steel base is marked; 3 POINT FE80 KLG and then in small print made in england.That’s about all I can tell you. I have an existing klg plug cap 90degree screw thread to ht lead and 17mm internal diameter other end. The cap is45mm both directions. Can you help with a replacement or who I could contact to get 2 of these. It is not for a motor bike. Many thanks john. I know its not from a motor cycle, but I have a marine engine which is fitted with a KLG G-20 spark plug and cannot find an equivalent. could you please advise. Thanks. Hi Guys I am a volunteer at an aviation museum in Australia and we have just taken ownership of a fully operational Rolls Royce Merlin engine.As part of the maintenance program we are looking at changing out all the ( well used) spark plugs- there are various plug types fitted at present including KLG KRSR – any ideas as to the “modern ” equivalent( someone said that the KLG RML 60 might be ) and where we can source them. Hi Bernie. Sorry, I can’t offer much help I’m afraid. There’s not much info available regarding KLG spark plug codes and the numbering (or rather lettering) system is not at all intuitive or easy to decide! All the info I have relates to the plugs used in motorcycles and neither of the plug codes you mention are listed at all. Maybe ask Rolls Royce what they recommend? Were these plugs used in both motorcycles and cars? Any ideas which marques used them? They were the equivalent of Champion N-57R. Were these plugs used in both motorcycles and cars? They were the equivalent of Champion N-57R. I have approx,3-400 nos NGK racing plugs ranging from FE 280 to FE 320, plus another 1-200 FE 100 to FE 305 non racing plugs, would these be mostly for automotive use or are there motor cycle applications for them also, all 3/4 inch reach. Hi I would like to know the equivalent or cross reference for a KLG 707LS spark plug that I have. I want to know if it is the same heat ranges a NGK 5 or NGK 6 plug? Hi there,great article and reference point. This is one area I’d always overlooked and it deserves more study. In my case I have changed from Champion L82c to L82yc on my 1950 Triumph Thunderbird. Seem to give a better burn with that projected tip,though I’m only at the early stages of testing.Just bought some KLG F85P from The GreenSpark plug co so looking forward to testing these. Many thanks for your work here. Thank you for the info listed here, great resource. It helped me find a modern replacement spark plug for my 1960 Royal Enfield Indian police chief. Hi there James,I put up close on 1000 miles on the T Bird using the KLG F85P last summer and was very impressed. The plugs stayed a nice light brown colour all along.Now I just had the the original carburettor rebuilt so that of course will help.In any case I can’t fault the KLG plug.The bike started today first kick after a six week lay up.A good mag,good plugs,and a sorted carb makes for happy classic biking.Thanks again. Try the Green Spark plug Company ,they still sell KLG and may be interested. Otherwise just check out their prices. I have had dealings with this Company and they are very amiable. Good luck. We are needing a replacement sparkplug for a J series Auster with a Gipsy Major engine fitted. The markings on the plug removed are KLG R.V.12/3. Can anyone give me a modern equivalent p/n. Hi Julie, From what I have been able to find out, I understand plugs are available from LAS Aerospace, based in Devon. Tel. 01837 658081. They could either be 12mm or 14mm but beware it could be a mixture of the two. Best take them out and get someone to measure the thread diameter. Part numbers are D6HA 12mm ,unscreened, RC50R 12mm, Twin electrode or RS9-1R 14mm, Twin electrode. If you take them out there will be a KLG reference number on them, which if you went on the NGK or Champion website, they have a cross reference section. Good luck. But it will probably run on pretty much any plug of the correct dimensions that fits in the hole! Hi Steve, The Green Spark Plug Company used to stock these, but now are out of stock. However they do recommend Champion D14, NGK AB-6 or Bosch as alternatives. I have a number of Cyclemaster powered pushbikes, three are currently “on the road”. KLG made up a “special” called the CF50 for this vehicle. It has three equidistant earth electrodes around the central electrode, which are supposed to rotate in use in order to cut down on lead fouling. This may even work! I use KLG F50, FS50 and CF50 Plugs, alternatives are NGK B5HS/4210, Champion L90C or DENSO W16FSU. All seem to work equally well. The vehicle is run on 100LL Avgas, which goes off much more slowly the motor fuel, and has NO ETHANOL! The vehicles do not exhibit any problems after a number of years use with these plugs and 100LL. My vintage Italian bike requires a KLG “F W E 80”. I’m guessing this is similar to the FE80? What does the “W” mean? Could it possibly mean “Watertight”? I have 4x KLG AL30 plugs brand new. Would like to know what they may of fitted? Hi Manuel, I have researched on “Green Spark Plug” Website’but they don’t seem to have a record for them.